Bedford rose to fame during the early '30s and was a market leader for well over half a century. Bedford commercial vehicles were as well known abroad as they were in Great Britain, having exported to some 170 countries around the globe. This book, the first such volume to be published in full colour, recalls leading model types from 1931 to Bedford's final demise in 1999 under Marshall SPV ownership. Exclusive colour photographs, mostly taken by the author, bring to life old favourites like the O type, S type, TJ and TK, not to mention lighter models such as the CA and HA vans. 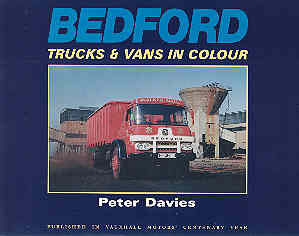 Peter Davies has been a truck enthusiast all his life. He has been active in almost every aspect of the hobby including photography, making and collecting models, restoring and rallying old lorries, collecting brochures and writing books and articles. He is a founder member and President of the Commercial Vehicle & Transport Club, founded in 1965. He lives in Bedfordshire with his wife Jill and German Shepherd Dog Holly. He has two grown up daughters, Jacqueline and Sara-Jane and three grandsons, James, George and Hugh. "Your could say that Bedfords have been my life. When about four years old I used to sit on my father's lap holding onto the steering wheel as we drove around Cardingshire farms on milk collection in a Bedford OWL. I travelled to school on a variety of buses - a 1937 WTB, a 1945 OWB 32-seater with Duple utility body and wooden slatted seats and a 1949 OB Duple Vista. The local coal merchant, also called Peter Davies, delivered our coal in a Bedford OSBT tipper. I remember the first S type I saw - from Roberts' Brewery in Aberystwyth, delivering to the Three Horseshoes in my home village of Llangeitho." "Bedfords were part of my everyday life and continued to be so when I went straight from school to work at the company in Luton. I was there until it closed in 1986. This book, to me, is very much a labour of love and I hope it will be enjoyed by all who have an interest in commercial vehicles".